Read the Key Verse with your class. Ask your students if they have ever known someone who did something wrong (or just plain stupid) on purpose? (i.e. : eat a worm, jump from the top of something dangerously high, hit someone back, sneak gum in school, copy someone else’s homework, etc.). Did it really hurt them at the time? (Probably not.) That person thought it was OK at the time, “right in their own eyes.” But, just because it seems OK, that doesn’t make it right. We see in this verse that someone like that is called a “fool” (means: silly; perverted; foolish) because they are setting a course for their life (way) that is not right according to God’s Word. But, notice that one who “hearkeneth” (means: to perceive a message; or hear with attention or obedience) to “counsel” (means: advice or wisdom) is “wise” (means: intelligent or clever). Summary: Today we begin our second lesson in the book of Proverbs. We continue learning the importance of God’s Word by searching Proverbs, the third Personal book for more words of wisdom. Remember that the wisest man, Solomon (whose wisdom was a gift from God – I Kings 3:12), wrote many of these words. We must learn the importance of practicing the practical portions of the right way to live a life of wisdom that pleases God. We found last week that we must begin to live that way early in life. Proverbs is a listing comparing wisdom to foolishness, wise to unwise, right and wrong, and even good and evil. Since it appears to have no organized thought pattern, just continual words of wisdom, we will look at some individual comparisons. As we learned last week, many of the words of wisdom found in Proverbs were written from a loving father as a warning to his only son. These words are important truths to be learned. We should encourage our students to not only memorize these pearls of wisdom, but apply these truths to their lives. Remember that these words were written to help us live our daily lives wisely. Emphasis: Teach your students the necessity of wisdom. God gave us the words of the Proverbs to help us see the difference between the “foolish” and the “wise.” Encourage them to learn to be wise, not in the wisdom of the world, but in the wisdom God’s Word teaches us. Help them see the importance of keeping their lives right (living upright and perfect – as Job, Noah, etc.) before God. Remind them that it begins at home by listening to the wise words of their parents who love them – just as God loves His people. One idea for today’s lesson: (See picture below). 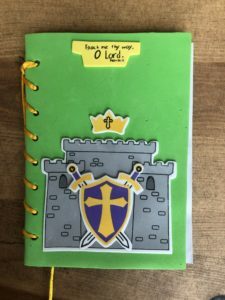 For today’s lesson I had journals for them to put together. 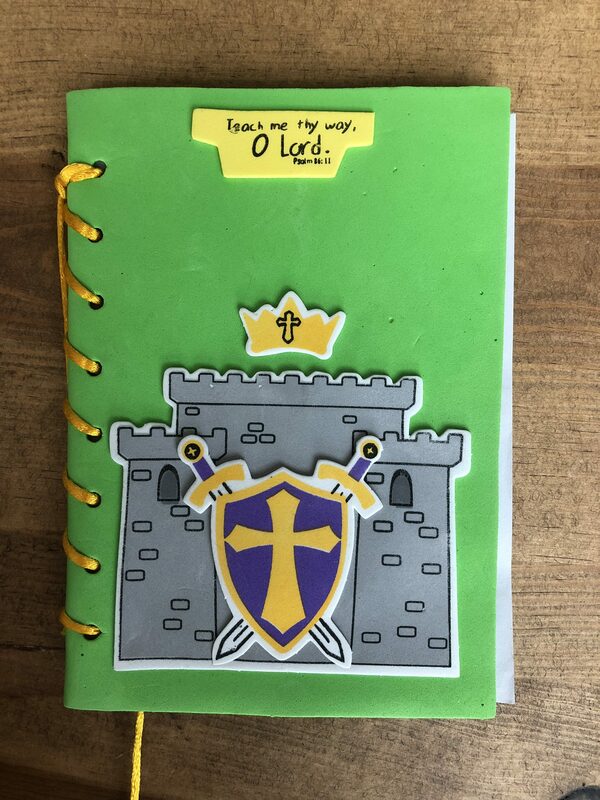 We put stickers of a castle, a shield with swords, and a crown (since King Solomon wrote Proverbs) on the front. We also put a sticker with a verse (Psalm 86:11) on the front. Inside we glued some preprinted verses from Proverbs. We also took time to write a few more verses from Proverbs as we looked at that book over the next couple of weeks. 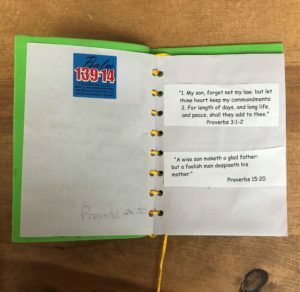 I encouraged them to read Proverbs and continue writing verses in their journals that spoke to them as they read. One of the best ways to remember averse is to write it down!